29th Oct.2012 "Computer News" - Unistal Has Participated in "Gitex Technology Week 2012"
Aug 2012 -Intex-About sensorship of fake content on the websites. Nov. 2011,Express Computer, Social Network Protection Feature. Oct, 2011,Compuvar, Unistal launches new version of protegent products. Oct, 2011,ITPV, Unistal launches new version of protegent products. Oct, 2011,NCN, Unistal releases new range of 2012 protegent products. Oct, 2011,Pressbox.co.uk, Unistal releases new range of 2012 protegent products. Oct, 2011,IT Voice, Unistal releases new range of 2012 protegent products. Oct, 2011,Computer News, Unistal releases new range of protegent products. Oct. 2011,The DQ Week, Unistal Providing Full Protection. Oct. 2011,InfoSecurity, Unistal Releases Protegent 2012 Products. Oct, 2011,Computer News, Unistal releases new range of 2012 products. Oct 17, 2011,Article Circulation, Unistal releases Protegent 2012 products. Oct 17, 2011,PR Fire, Unistal releases Protegent 2012 products. Oct 17, 2011,Cell IT, Unistal releases Protegent 2012 products. Oct, 2011,Articles Base, Unistal releases new range of 2012 products. Oct, 2011,Press Releases, Unistal releases Protegent 2012 products. Oct, 2011,Free Press Releases, Unistal releases Protegent 2012 products. Oct 5, 2011,Click IT, Unistal releases Protegent 2012 products. 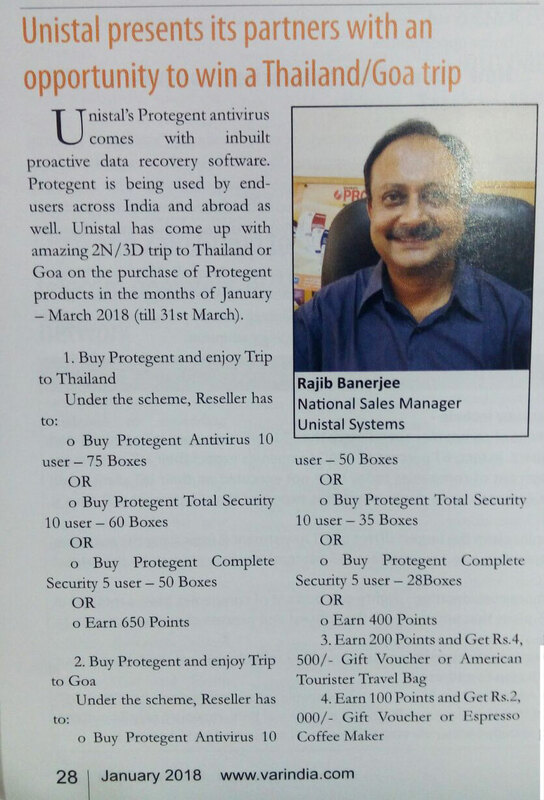 Oct 10, 2011,Computer News, Unistal Unleashes Protegent 2012 products. Oct 10, 2011,IT Web Quest.com, Unistal Unleashes Protegent 2012 products. 2011,Var India, Unistal Releases New Range of Protegent 2012 products. Oct 10, 2011,Var India, Unistal Releases New Range of 2012 products. Oct 08, 2011, IT Var News, Unistal launches new version of Protegent range. Aug 2011, Infosecurity - Interview- The most critical asset today. May,Click IT News- Unistal releases new version of protegent enterprise security with asset tagging, tracking and early warning system. May,Click IT News- Unistal releases new version of protegent enterprise security. May,Candid - Unistal releases new version of protegent enterprise security with asset tagging, tracking and early warning system. Sep 15, 2009 Will Aarushi's Phone Talk? Jan 15, 2011 – The Economic Times – India's Largest Information Communication Technology & Electronics Exhibition! March 14, 2008 – Hindustan Times – Tracking Your Stolen Laptop ? March 11, 2008 – EFY Times - Find Your Stolen Laptop With Locate Laptop!